Back in the 1910s and 1920s, Samuel Insull, president of Commonwealth Edison in Chicago, and banker J.P. Morgan put together a network of privately owned holding companies that controlled must of the major electric utilities in the US. In the late 1920s and early 1930s, this dangerous pyramid of companies collapsed, threatening the stability of electrical service across the country. In 1935, the US Congress passed the Public Utility Holding Company Act which limited the size and activities of utilities to prevent the collapse of dangerous financial structures that threatened the US electrical and natural gas infrastructure. This federal law remained in place until the Cheney Administration and the Republican-controlled Congress repealed it as part of the 2005 Energy Policy Act. The 2005 Energy Policy Act was the same law that granted massive rate payer subsidies to power companies for building new high voltage transmission lines. Readers of The Power Line are very familiar with the disastrous impacts of this transmission subsidy scheme. So erstwhile “free market” Republicans passed the 2005 Energy Policy Act to encourage the growth of new, unstable monopoly holding companies in the electricity markets and huge subsidy schemes for those same holding companies to build obsolete and unneeded high voltage transmission, all at the expense of electric retail customers. We are witnessing the results of the repeal of the 1935 Utility Holding Company Act in real time. Holding companies AEP and FirstEnergy have dumped obsolete coal-fired power plants onto the captive electric bills of West Virginians. New post-2005 repeal holding companies are merging into ever fewer monopolies that operate in multiple business lines and exert increasing power in regional transmission organization cartels across the US. The attempt by Chicago-based Exelon to swallow regional distribution company PEPCo Holdings on the East Coast is just the latest in the holding company monopoly game, and this one even includes Atlantic City. I have posted a number of times, here, here, here and here, about the Exelon merger, because the forces at play in this case offer real insight into the train wreck that is West Virginia’s electrical system. In the last few years, the WV PSC and the two Ohio-based holding companies that control WV’s electric utilities have played West Virginians for chumps. AEP’s and FirstEnergy’s coal-fired power plants can no longer compete in wholesale electricity markets, so friendly regulators have forced their WV customers to pay for much more power plant capacity then customers will need for the next thirty years. Exelon is moving to create that same situation for the customers of PEPCo’s companies. Exelon’s shaky holding company structure is almost entirely dependent on expensive and obsolete nuclear power plants. Like coal-fired power plants, nukes are struggling to compete in the free market. Exelon is paying billions of dollars above PEPCo’s stock value because it wants access to PEPCo’s captive rate payers in stable regulated retail markets. Wall Street bankers have seen the dangers facing unstable electric holding companies and their obsolete generating plants. Starting last May with Barclays Bank, major investment banks have been downgrading the bonds of the entire electrical generation sector because they can no longer compete with natural gas plants, investment in energy efficiency and renewable power. Last week, the Institute for Energy Economics and Financial Analysis published an in depth report by WV’s own Cathy Kunkel describing exactly how and why Exelon wants to control a captive PEPCo Holdings for its own profit. Also last week, the always entertaining and informative David Roberts provided an overview of the Exelon/PEPCo merger, plus some important history and context. If you are interested in real electricity innovation in the US, you need to understand the massive forces that are arrayed against us. Understanding the newly hatched monopoly holding companies that control electricity in our country is essential for identifying who is resisting change and why they are doing it. While the new holding companies still control most of the US electrical grid, they are becoming increasingly desperate as their market base erodes and their financiers get weak in the knees. These companies have become the enemies of the free market in electricity. Their only hope is to manipulate the political and regulatory process to maintain their slipping grip on power, as their industry association recommended back in 2013. Look closely at the links in this post, and you will be able to see beyond the misleading information that pops up in the media (most of it from power company press releases) to see what is really at stake. As I have always said here on The Power Line, knowledge is power. As shown in the table U.S. Electric Output, in 2013 the U.S. electric industry made available for distribution in the continental U.S. 3,993,521 gigawatt-hours (GWh) of electricity, an increase of 0.1% over 2012’s total of 3,991,408 GWh. This is the first time since 2010 that there has been a year-to-year increase in U.S. electric output, and 2013’s total was barely above 2005’s 3,992,966 GWh. Yes, you read that right: “2013’s total was barely above 2005’s”. That is eight years of essentially flat US load growth. On a regional basis, four of the EEI regions experienced increases in electric output in 2013. The South Central region saw the largest year-to-year gain at 1.9%, with the New England, Mid-Atlantic, and Pacific Northwest regions also showing growth. The Pacific Southwest region saw the largest decrease in output, at -1.5%. The Central Industrial, West Central, and Southeast regions also experienced decreases in output for the year. In EEI’s system, WV is divided between the Central Industrial region (northern and western WV) and the Southeast (southeastern WV). On a weather-adjusted basis, electric output actually declined in 2013 by 0.6%. 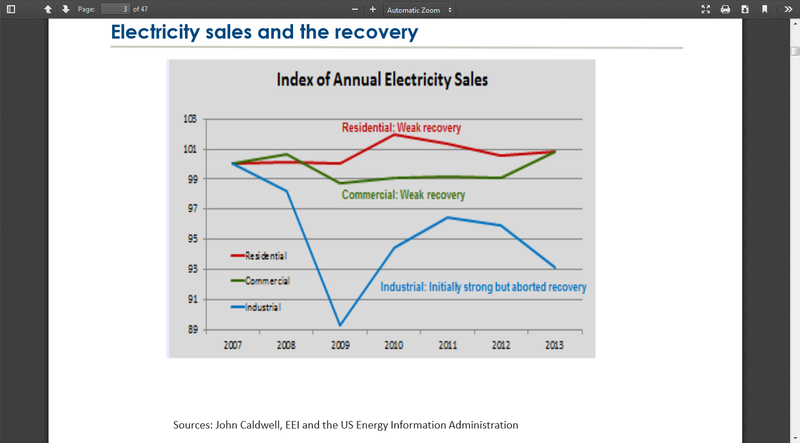 The anemic rebound [in the economy] continues to impact electricity sales in every sector, although increases in the adoption of energy efficiency are also contributing to the protracted weakness in sales. When the industry identifies energy efficiency measures as “contributing to the protracted weakness in sales” look for the kinds of political and regulatory attacks on efficiency standards that we have seen in OH from FirstEnergy. Big holding companies don’t like “protracted weakness in sales.” If EEI is saying outright that energy efficiency is hurting the industry’s profitability, then it is. The era of flat demand represents a whole new world for the US electricity industry, and the corporations that dominate the industry are having a very hard time adjusting to it. Here’s the story from Reuters. Germany’s top utility E.ON (EONGn.DE) said it would split in two, spinning off power plants to focus on renewable energy and power grids, in a dramatic response to industry changes that could trigger similar moves at European peers. Europe’s power sector has been hit by weak energy demand in a sluggish economy, low wholesale power prices and a surge in demand for cleaner renewable energy which is replacing gas and coal-fired power plants. The Brattle Group is an industry consulting firm that knows what it is talking about, most of the time. Here is a link to a presentation by a Brattle Group engineer, Ahmad Faruqui, at a June 2014 electric industry conference. So all that stuff we heard from PJM back in 2010 and 2011 about how demand would recover when the “recession” ended just hasn’t happened. And, of course, this is all part of a long term trend that started back in 1950. What are the options for electric utilities? Mr. Faruqui essentially dismisses the first three options as all having failed to save utilities’ bacon in the past. The rest of his presentation describes what he means by an “energy services utility.” You can go to the power point slides and see his description for yourself. I think you will come away, as did I, with the feeling that this really isn’t a practical solution either, for most utilities. The fact that a very smart engineer from the Brattle Group can’t really come up with any good solutions to utilities’ current problems is a sign that power companies are in real trouble. Stagnant Demand Now Well Established in US Electrical System: Bleak, or Not Bleak? I have been citing Rebecca Smith’s excellent reporting on falling electricity demand in the US for almost five years. The Wall Street Journal’s editors deserve credit for keeping Ms. Smith on the electricity beat so she has the time to develop a deep understanding of the industry. Most media outlets don’t allow this kind of growth, and their reporters simply reprint industry press releases instead of doing real journalism. Last week, Ms. Smith updated her longstanding coverage of the decline of US electricity demand and its dramatic impact on the US electrical industry. Here is a link to her story, but you will have to have a subscription to the WSJ to view it. Ms. Smith’s story is a status report on the now well established disconnect between US load growth and economic growth, which I have also been covering here on The Power Line. A graph in her article, taken from the Dept. of Energy’s Energy Information Agency, shows that 2008 was the peak for annual US electrical production, with a total of 3.77 trillion kwh. Production has not reached that level in the five full years since then, and the EIA does not project any change in that trend in the future. 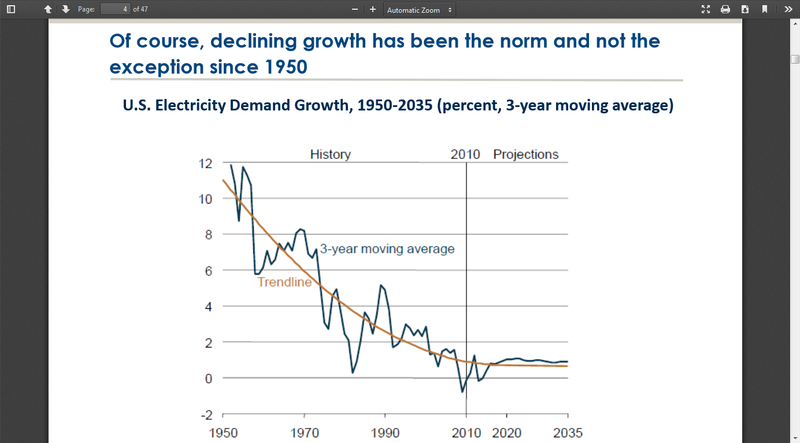 US power company mouthpieces claim that electricity demand will continue its past upward trend “when the economy turns around,” but the disconnect between economic growth and electrical load growth shows that this is unlikely to happen. So the US is now “past peak” in electricity demand. Sales volume matters because the power business ranks as the nation’s most capital-intensive industry. When utilities are flush with cash, they buy lots of expensive equipment and raise dividends for investors. When they’re selling less of their product, they look for ways to cut or defer spending. Regulators typically allow utilities to charge rates that are high enough to cover their basic expenses, but that doesn’t guarantee them strong profits. Utilities typically need to expand sales volume by 1% or more a year just to maintain their expensive, sprawling networks of power plants, transmission lines and substations, says Steven Piper, an energy analyst for SNL Energy, a research company. “That’s where the existential crisis is coming from,” he adds. Historically, economic expansion meant expanding electricity sales. In fact, during the 1950s and 1960s, energy demand outpaced the growth in the gross domestic product. Then, from 1975 to 1995, GDP and electricity sales grew in tandem. solar panels that cost 70 cents a watt, a fifth of the cost in 2008. Solar energy “is the next shale gas,” says Sunnova Chief Executive John Berger, predicting it will upend the utility business. Energy efficiency blunts the impact of population and economic growth, because upgrades in lighting, appliances and heavy equipment reduce energy needs. In 2005, the average refrigerator consumed 840 kilowatt-hours of electricity a year, according to the U.S. Energy Information Administration. A typical 2010 replacement needed only 453 kilowatt-hours of electricity. To fight rising costs, Washington, D.C., has hired a consultant to help cut its electricity use 20% by 2015—and to save $10 million a year. FirstFuel Software sniffs out waste at the district’s 400 buildings with the help of smart meters and special software. “We’re not going to win the grand innovation prize,” says Sam Brooks, head of energy and sustainability for the District of Columbia, but he adds that just turning off the lights and shutting off furnaces when buildings are unoccupied turns out to be an easy way to save money. And Ms. Smith concludes with a quote from our old friend, FirstEnergy CEO Tony Alexander, trying desperately to put a happy face on the company’s future. Electricity demand also isn’t bleak everywhere. FirstEnergy Corp. based in Akron, Ohio, says demand is increasing from such industries as steel, auto, oil refining and chemical production. But that hasn’t been enough to make up for losses elsewhere. Anthony Alexander, the company’s chief executive, forecasts that it will take until 2016 at the earliest for its electricity sales to recover to prerecession levels. “It’s pretty much a lost decade,” he says. I find it hilarious that Ms. Smith introduced the FirstEnergy paragraph with the words “isn’t bleak.” Go to yesterday’s Power Line post on UBS’s downgrade of FirstEnergy’s stock. In his analyst report, UBS industry specialist Julien Dumoulin-Smith said about FirstEnergy’s future, “It looks bleak.” Oops. The NYT reports this morning that ten states had already met the new federal targets for carbon emissions reductions by 2012. This is an indication that the choice of 2005 was an easy way to let states off the hook for real reductions. Much of the carbon emissions reductions has happened because electricity demand has fallen, not from any other changes in behavior or generation. Although reductions from falling demand indicate how weak the new EPA standard is, they also illustrate the kind of impact demand management, including investment in energy efficiency and conservation, can have. The whiners need to stop whining and get to work. Maine, Massachusetts, New Hampshire and New York cut their power-sector emissions more than 40 percent from 2005 to 2012, according to the Georgetown Climate Center, with Maryland close behind at 39 percent. The states are part of a nine-state project called the Regional Greenhouse Gas Initiative and, like much of the country, have benefited from the recent abundance of cheap natural gas.